Big, bold, and brassy, Hollyhocks seem to revel in being the life of the party, and there’s nothing wrong with that. In fact, there’s little to nothing wrong with the plant, that I can think of. I’ve seen them erupting from a wide crack in a city sidewalk, tall, stout, and in glorious bloom, so there’s no great trick to growing them. They do, however, naturally tend to be short-lived, so the secret to keeping blooming specimens in the garden is to give each plant ample space and allow plants to go to seed, in addition to removing and replanting daughter plants, as described below. Seeding: Direct sow in fall or start indoors in mid-winter. Flowers should be produced the first summer. Plants started in spring or summer should flower the following summer. Hollyhock prefers full sun but tolerates some shade. The soil should be of average fertility and well drained. Plant in an area that is sheltered from strong winds. Division is unnecessary for this short-lived perennial. Rotate the planting site each year or two to help keep rust problems at bay. Many Hollyhock cultivars will self-seed, or you can collect the seeds yourself for planting. 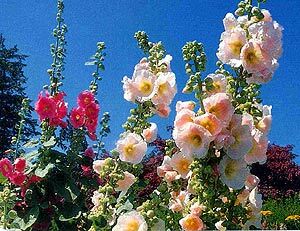 To propagate cultivars that don’t come true to type from self-sown seed (or to propagate any Hollyhock you enjoy), carefully detach the small daughter plants that develop around the base of the plant and replant them where you want them. With one or both of these techniques, you should be able to keep strong, healthy Hollyhock plants coming back year after year in your garden. Promptly remove leaves peppered with tiny orange dots of rust to help keep the disease under control. In fall, leave healthy basal growth intact but remove and burn any tatty leaves. Use Hollyhock as a background plant or in the center of an island bed. A fence or wall will provide shelter and support. Stake plants in a windy location. Hollyhock plants become shorter and bushier if the main stem is pinched out early in the season, when it is about 6–12″ tall. The flowers are smaller, but the plant is less likely to be broken by the wind and can therefore be left unstaked. Old-fashioned Hollyhock varieties commonly have single flowers and grow very tall. One advantage to using older varieties is their higher resistance to disease. As nearly always with perennials, I prefer the look of the older varieties to the hopped-up, laboratory-improved, new-fangled double varieties. A. rosea is a short-lived perennial that bears flowers on tall spikes. It reappears in the garden by virtue of being a prolific self-seeder. It grows 3–9′ tall and about 12″ wide. From mid- or late summer to fall, it bears flowers in shades of yellow, white, pink or purple. Chater’s Double Hybrids bear ruffled, double flowers in many bright and pastel shades. This cultivar grows 6–8′ tall and is more consistently perennial than the species. ‘Nigra’ bears single flowers in a unique shade of dark reddish black, with yellow throats. ‘Summer Carnival’ is an early-blooming, double-flowered cultivar with flowers in a wide range of colors.